London, the end of the 19th-century. 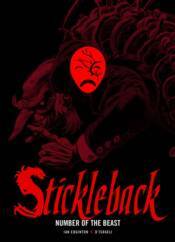 Stickleback, the Pope of Crime, rules the capital's criminal fraternity as the boss of a powerful gang made up of freaks, oddballs, and semi-supernatural entities. But this position is far from stable and now a mysterious figure stationed on an airship soaring high above the city is vying for power. A brutal encounter is inevitable, but one thing is certain - live or die, Stickleback's future is going to get a whole lot more complicated!